After several years of protracted investment in military infrastructure projects, there is renewed optimism that new construction and restoration and modernization programs will see increased funding. 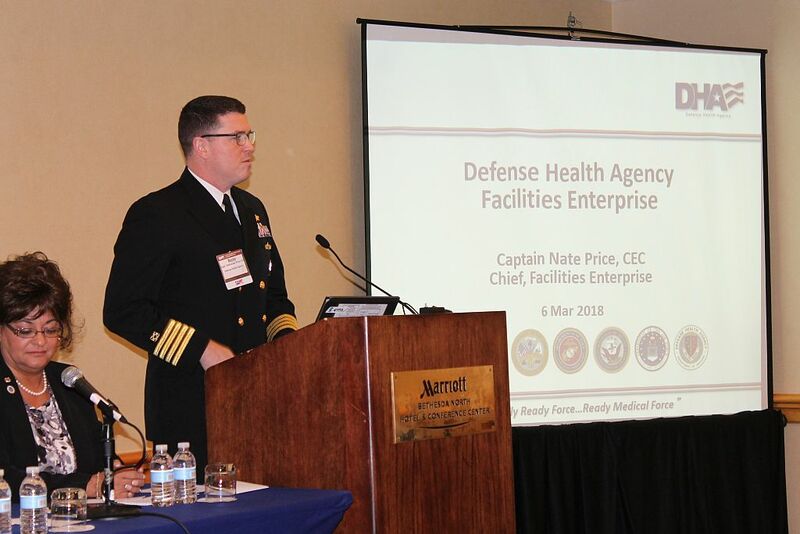 This was on full display at the FY2019 DOD & Federal Agency Program Briefings, hosted by SAME on March 6, 2018 at the Bethesda North Marriott Hotel & Conference Center, North Bethesda, Md. 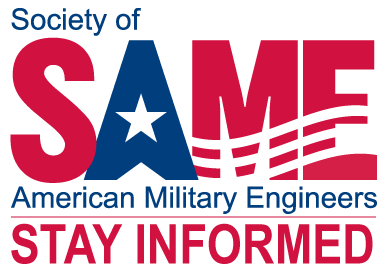 This annual event, part of SAME Capital Week, presents forecasts and insights on upcoming design, engineering, construction, environmental, and research and technology programs of the Department of Defense and several other federal agencies. Presenting agencies this year included the U.S. Army Corps of Engineers (USACE), Naval Facilities Engineering Command (NAVFAC), Air Force Civil Engineer Center (AFCEC), Army Installation Management Command, Army & Air Force Exchange Service, Bureau of Overseas Buildings Operations, Department of Energy, National Nuclear Security Administration (NNSA), U.S. Customs & Border Protection, General Services Administration (GSA), Department of Veterans Affairs, and the Defense Health Agency. 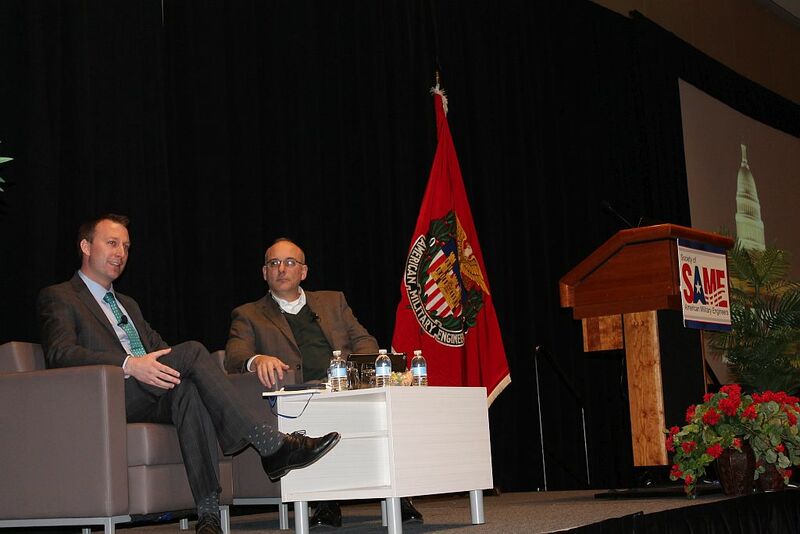 Additionally, this year featured The Honorable Lucian Niemeyer, Assistant Secretary of Defense (Energy, Installations & Environment) who provided perspective on project delivery trends within the defense sector. Then during the luncheon, attendee heard from two Professional Staff Members of the House Armed Services Committee who discuss changes to military construction authorities made in recent years and shared insights into issues under consideration for the upcoming FY2019 National Defense Authorization Act. The morning began with welcome remarks from SAME Executive Director Brig. Gen. Joe Schroedel, F.SAME, USA (Ret. 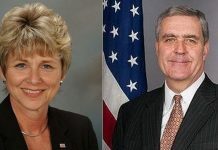 ), who introduced Assistant Secretary Niemeyer, who briefed attendees on directives from the Secretary of Defense where budget and capabilities were concerned. The assistant secretary discussed the urgency and need for the A/E/C community to produce results in the areas of resilience and lethality, and for the public and private sectors to work together in evaluating reforms to business practices and ensuring sound use of fiscal resources. Following The Honorable Niemeyer, SAME National President Col. Sal Nodjomian, P.E., F.SAME, USAF (Ret. ), welcomed the panel of Service Engineering Chiefs to the stage. 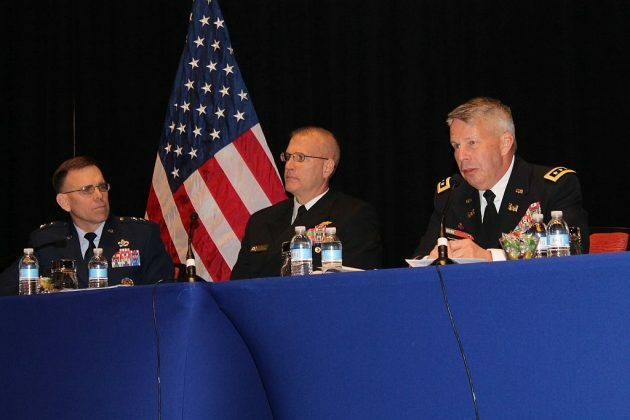 This year’s panel comprised Lt. Gen. Todd Semonite, P.E., USA, U.S. Army Chief of Engineers and Commanding General, U.S. Army Corps of Engineers; Rear Adm. Bret Muilenburg, P.E. 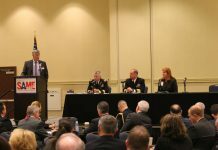 CEC, USN, Commander, Naval Facilities Engineering Command, and Chief of Civil Engineers; and Maj. Gen. Timothy Green, P.E., USAF, Director of Civil Engineers, Deputy Chief of Staff, Logistics, Engineering & Force Protection, HQ U.S. Air Force. Gen. Semonite touched on the importance of the USACE partnership with SAME and discussed allocation of funds. 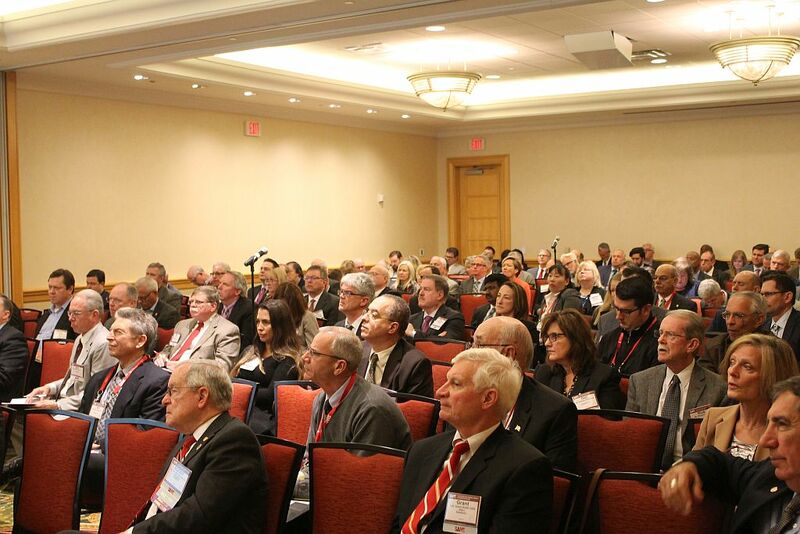 He gave an overview of major programs and informed attendees that USACE is preparing where to invest what could be a significant $17 billion disaster supplemental Congress has authorized, which is intended to be applied to increase resilience of a number of existing flood risk management assets it maintains across the country. After last fall’s devastating storms, there is growing interest in reducing future damages to infrastructure by investing now in resilience measures. USACE is also seeing further investments in Afghanistan, Poland and other areas, while missile defense in Romania is around $1 billion. The agency also expects to perform about $3 billion of work for the Air Force. 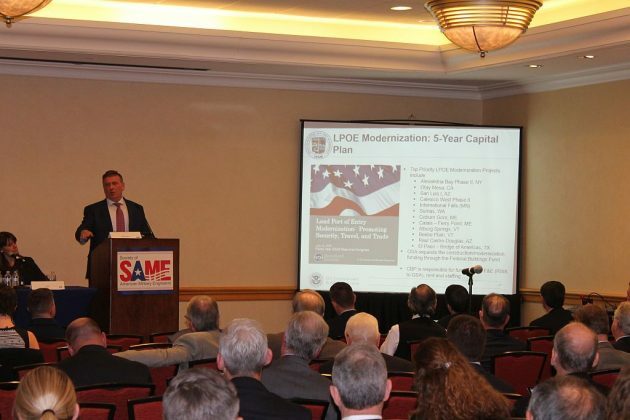 USACE expects an emphasis on smaller projects that are high priority. On a large-project scale, it would like to focus on getting Department of Veterans Affairs hospitals back up and running, as well as forecasting needs for an $18 billion wall across the United States/Mexico border. The Corps will lean on construction management services from industry to address some of these needs. Gen. Semonite said above all they want to be relevant, provide quality, and do it on schedule and at cost. The Navy has a renewed sense of urgency to outstanding quality. In his overview, Adm. Muilenburg stressed readiness and lethality as a priority and means to absolute dominance. 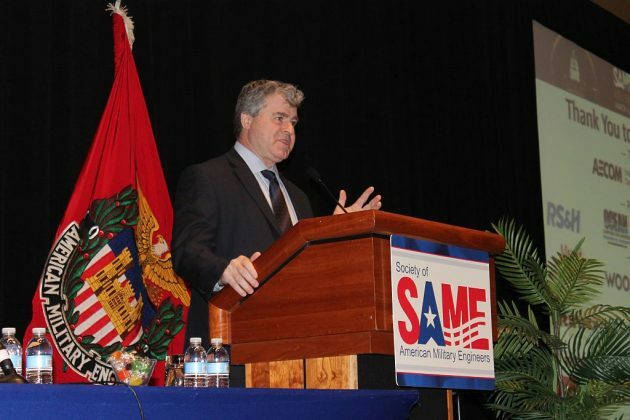 As far as upcoming priorities, NAVFAC is focusing more on energy security. NAVFAC is focused on cost and scheduling, along with adhering to the CPAR System. Sailors and Marines deserve the best quality we can give, the admiral said, and so we are all being expected to raise our game. The assistant secretary discussed the urgency and need for the A/E/C community to produce results in the areas of resilience and lethality, and for the public and private sectors to work together in evaluating reforms to business practices and ensuring sound use of fiscal resources. Air superiority is not the only area of concentration for the U.S. Air Force. Gen. Green said the service is investing in readiness through aircraft, space and cyber security. He is concerned about the Air Force’s ability to perform based on the current and past budgetary challenges, yet hopeful for the upcoming projects. Although military construction spending will likely be down, restoration and modernization is becoming a larger area of investment. That budget has increased. The Air Force is focused on groundwater remediation and studying energy resiliency and cyber/operational technology among other priorities. Following their briefings, the engineering leaders took questions from the audience. The main questions centered on cyber control and how it is being sought, as well as environmental issues and national disaster recovery in the wake of numerous dangerous events. Other concerns were which types of contract machines or new acquisition strategies exist and the best way to work with government agencies and service branches. USACE Civil Works Program. Maj. Gen. Ed Jackson, P.E., USA, Deputy Commanding General for Civil & Energy Operations, HQ USACE, discussed the Civil Works Program. There was a large transition within Civil Works leadership positions over the past two years; however, it remains committed to delivering integrated water resource solutions and to reducing disaster risk. Last year, disaster response for Hurricanes Harvey, Maria and Irma, and the California wildfires was $1.1 billion. The program supported temporary housing, power, roofing, debris removal and grid recovery. Congress is working to provide additional funding to invest now, in better securing vulnerable areas prior to storms or disasters. The Civil Works Program is looking at innovative project financing now, more than ever. Public-private Partnerships remain a potential opportunity, but will continue to move ahead cautiously. Notably, the agency is committing to moving away from being a risk averse organization and evolving into an organization that can bear more risk. The goal is to be effective and find more ways to finance our nation’s water resource infrastructure requirements. The Corps will turn its lens on the permitting process, working to streamline and make improvements. Ultimately, it wants to make it easier to work together with industry. Air Force Design & Construction. 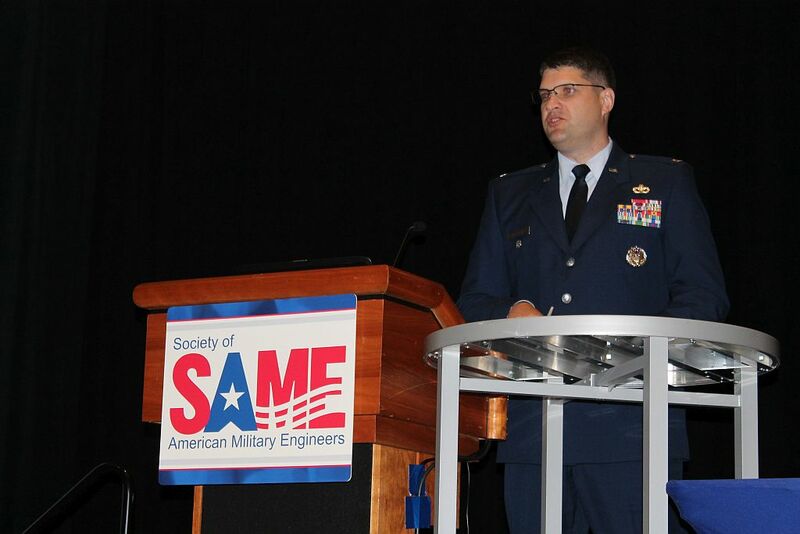 Dennis Guadarrama, Chief, Procurement Enterprise Division, and Col. Scott Matthews, USAF, Director, Facility Engineering, presented on the Air Force’s engineering programs. Guadarrama discussed ongoing contracts and those yet to be awarded in various regions across the country. His branch at AFCEC serves as the lead agent on all acquisition and procurement. As such, it will facilitate business partnerships with other agencies and industries. The Air Force wants to focus on CPARs adherence and use it to optimize opportunities. It is specifically seeking to develop common requirements, reduce duplication of contracts, improve mission value and total cost of ownership, and apply demand management practices. Col. Matthews, who executes the Operations & Maintenance Program, emphasized his department’s job to provide effective platforms to enable combat power in the air, space and cyberspace: “Back to basics and back to bases,” he said. 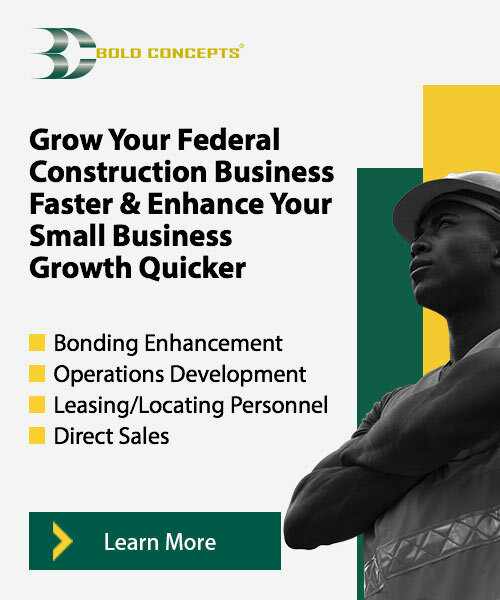 In upcoming work, there will be a host of support facilities and beddowns for military construction investments in FY2019. Col. Matthews said there is energy behind developing leading indicators or best practices in order to implement more impactful change. Networking Keynote Luncheon. During the keynote luncheon, attendees heard from Brian Garrett and Capt. Andrew Schulman, RA, CEM, USN (Ret. ), both professional staff members with the House of Armed Services Committee. They discussed the FY2019 budget outlook, evolving authorities, and up and coming investment areas—led by a focus on resilience. After the prepared remarks, attendees were able to ask the panelists questions. The discussions centered on the late arrival of budgets and if there is relief on the horizon; response to natural emergencies; resilience; and whether or not earmarks, or similar types of targeted investment, are beneficial. Department of Energy and Department of State Programs. Marcus Herbert, Acting Managing Director for Program Development, Coordination & Support gave an overview of the program for the Bureau of Overseas Buildings Operations and it was a call to action for contractors to compete for contracts. Security and sustainability needs are on the rise, with many areas available for industry to perform work. He did detail the diversity of locations in which the agency requires contractors to work; some project locations are beautiful and nice to work in, while others can be dangerous. 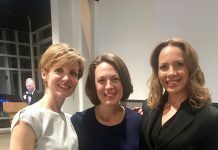 Herbert encouraged small businesses to partner with a large firm and go after the agency’s opportunities, as it is always looking to strengthen the group of bidders. Cameron Manning, SES, F.SAME, Director of NNSA’s Office of Enterprise Project Management discussed the agency’s goals for the upcoming fiscal year. NNSA’s budget is increasing and it is looking to partner with industry to support key infrastructure projects. Its focus has expanded to include not only nuclear work, but also fire stations, emergency centers, electrical upgrades and HVAC upgrades. 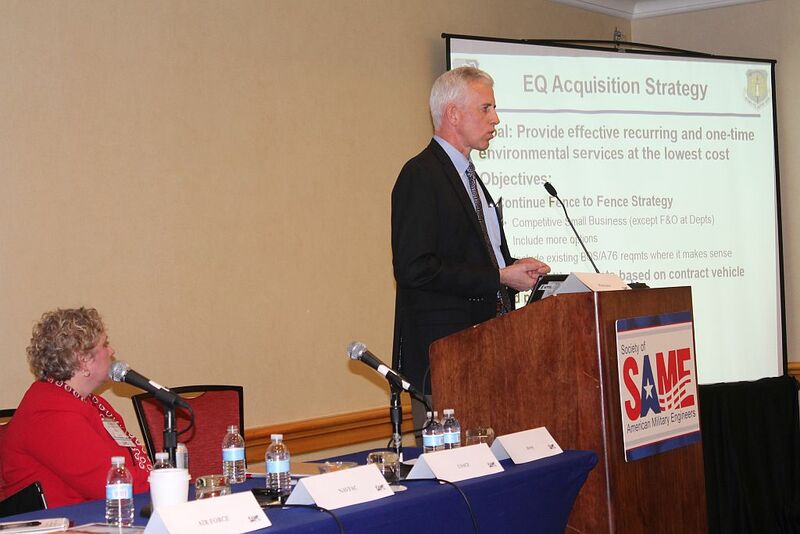 NNSA recently initiated new acquisition strategies to get contracts in place and on a trajectory toward success. 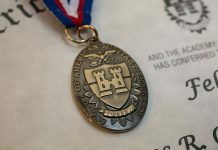 Like several other agencies, it is looking to increase the competitive pool of companies vying for work. There has historically been a smaller group of firms that have competed in this space; but the more businesses that can do the work and compete for it, the better value it will get. General Services Administration and U.S. Customs & Border Protection Programs. GSA Chief Engineer Natalie Huber briefed on the agency’s regions and programs. There are 11 regions across the country. GSA manages thousands of public buildings, construction of federal courthouses, and controls 168 land Ports of Entry, which also have design and construction challenges. The program’s top priorities are sustainability, productivity and technology. GSA has requested $10 billion tin the FY2019 budget to maintain and operate the buildings and real estate under its charge. NNSA recently initiated new acquisition strategies to get contracts in place and on a trajectory toward success. Like several other agencies, it is looking to increase the competitive pool of companies vying for work. No matter the project, construction excellence is GSA’s goal. The agency encourages industry to engage in its Design Excellence Program. It is touted as an efficient and successful way of initiating a working relationship with GSA and being successful on projects. Then, to close the final session of the day, Mike Germinario provided an overview of the U.S. Customs and Border Protection’s program. The agency is responsible for securing the border while facilitating legal trade, travel and immigration. Germinario walked attendees through a day in life of Customs & Border Protection. Even though the border has not seen the same activity as there was in the past, it remains busy. In a given day, nearly 1 million people come through the borders, along with billions in imported goods and tons of drugs and other illegal violations. To effectively secure our country, the agency utilizes facilities and relies on infrastructure. The leased space and other locations provide the ability to perform operations and support its mission. Resilience, modernization and energy efficiency are priorities integrated into upcoming projects. 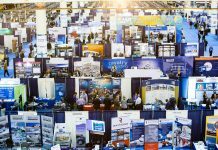 Industry opportunities to work with Customs & Border Protection lie in the mostly regional contracts that are awarded for renovation and upgrading of their facilities. 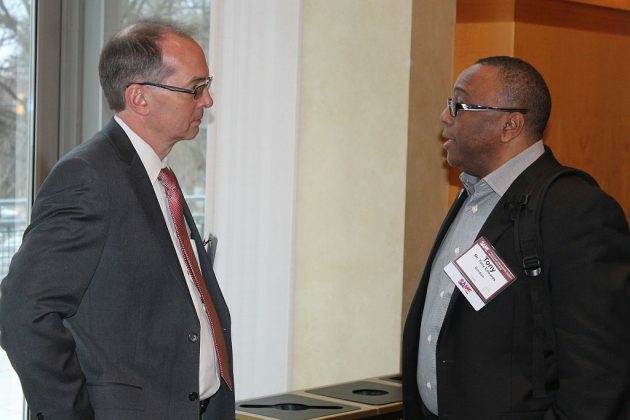 Following the briefings sessions, attendees gathered for a Networking Reception, where the days’ information and insights gave way to exchanging business cards and laying the groundwork for strategic plans to help the government meet its growing requirements. The more than 600 SAME members who came for the FY2019 DOD & Federal Agency Program Briefings left with a different mindset than the last few years, where austerity was more the mantra. Looking ahead, with the lower investments in recent defense budgets for new construction and operations and maintenance of existing assets, there is a large backlog of deferred work—work that will become greater priorities in the coming years along with evolving needs to meet the new priorities outlined in the new National Security Strategy and National Defense Strategy, as well as President Trump’s proposed infrastructure investment plan. 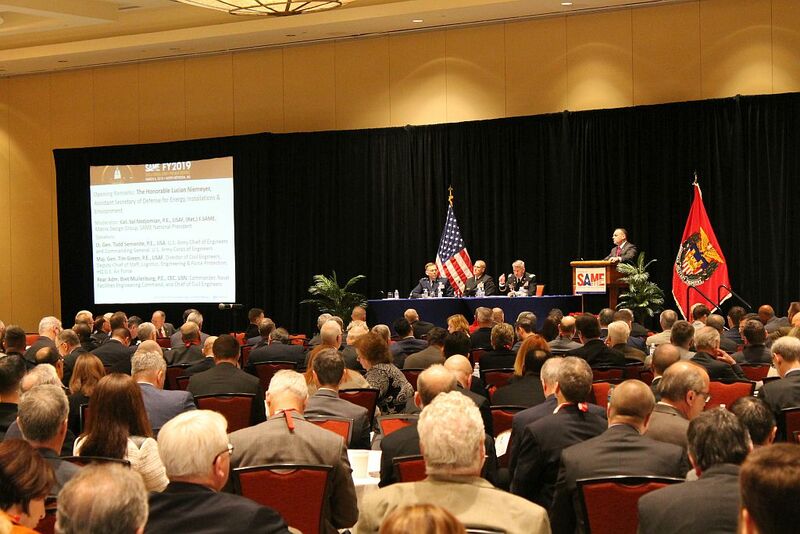 Click here to view session presentations from the FY2019 DOD & Federal Agency Programs Briefings. Visit SAME’s Flickr page to see all the photos from the event.